KATHMANDU, Feb 18: For anyone born on February 18, 1951, the day democracy came to Nepal, it has been a lifetime wasted by political instability decade after decade and lack of economic vision among successive leaders. Countries like South Korea and China that were at about the same level as Nepal some 66 years ago have excelled along the path of economic development but Nepal has lagged woefully behind. "In 1965, Nepal's per per capita income stood at $65, and South Korea's at $105. While Nepal's per capital income increased by 12 times to $766 in the last 50 years, South Korea's increased more than 300 times to $34,000," said former finance secretary Rameshwor Khanal. The couple of years from 1951 to 1957 were an ideal period for economic development but Nepal could not take advantage of this due to the ongoing aftereffect of the 104-year Rana regime. Since then too, Nepal has not seen continuous growth due to political and policy instability, according to a member of the National Planning Commission (NPC), Swarnima Wagle. 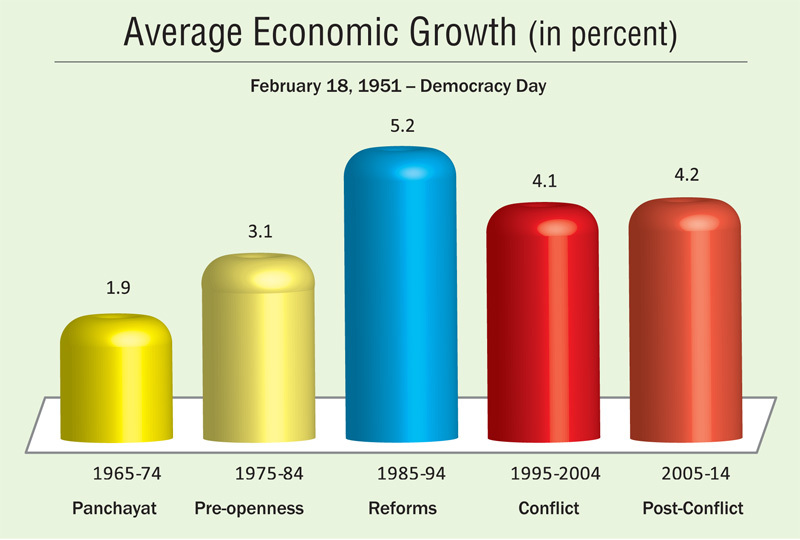 "In the 1985 to 1994 decade -- the last years of the Panchayat regime and early years of restored democracry -- Nepal witnessed a spurt in economic growth," he said, adding that the average economic growth then stood at 5.2 percent, the highest to date. "This also proves that the economy needs a liberal policy to grow," he said. Another economist, Bishwa Poudel, seconds the view. "Personal and economic freedom are key to development," he said. Economic growth has not been consistant also because of the Maoist insurgency, he further said, adding that the economy was faring well enough until the insurgency kicked in back in February, 1996. The decade-long armed insurgency dragged down economic growth, massively fuelling migration and industrial downslide. Industrial growth that had recorded a high of 9 percent skidded continuously to around 6 percent due to the disruptions created by the Maoists. When they came to power in 2006, the Maoists claimed that they had become converts to liberal economic policy, but they have only promoted crony capitalism. They have forced industrialists to shift to trade rather than open new industrial ventures and risk getting mired in labour disputes. Chronic power outage, running labour disputes backed by the Maoist party, policy inconsistency and lack of connectivity pushed up the cost of industrial production. Industrialists turning to trade instead has hampered employment generation and also rendered the economy lopsidedly import-dependent. Wagle claims that all is not lost yet. "There has been an increase in life expectancy, the literacy rate has risen and people have more social security," he said. However, he added that there has to date been no big push factor in the economy, which is the need of the hour. Wagle also opined that Nepal can recreate the magic of its post-liberal economic era, when growth touched 7.2 percent, with a second generation of reforms. 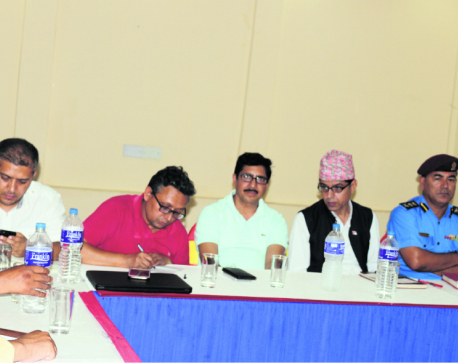 Former finance minister Dr Ram Sharan Mahat said the economy is afloat thanks to the economic reforms that he brought about during the 1990s, and it's time for second generation economic reforms to create the push needed for the country to graduate to a developing-country status by 2022 and to middle-income status by 2030.